In December 2016, 100 artists submitted ideas for what their dream fabric collection would look like to Uppercase Magazine�s New Designer competition. 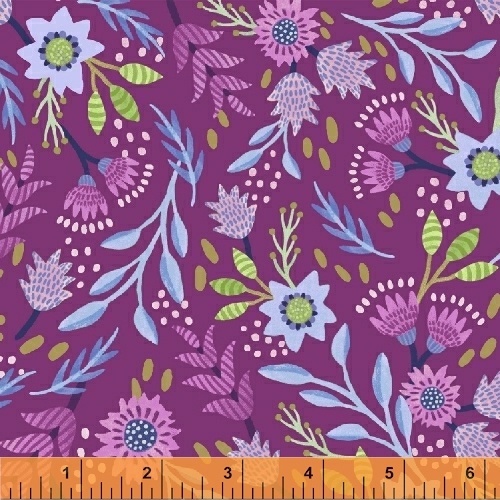 Out of those 100, the top 20 were selected by Uppercase�s creator and editor Janine Vangool and shared with Windham Fabrics� creative team. Ultimately, Mia Whittemore�s submission stood out above the rest and she was awarded the grand prize � the chance to bring her design ideas to life with her first fabric collection, Flourish. The inspiration for Flourish began with Mia�s watercolor painting of whimsical vases, one of her favorite subjects to paint. These vases feature many patterned details and botanical elements, which provided many design possibilities. Mia imagines these patterns as a perfect match for vibrant home decor accessories as well as fun children's apparel. 17 skus. On Sale August 2017. Delivery to stores March 2018.